I really appreciate Mr. Briones. He knew my case, listened to my concerns, and had thoughtful suggestions. 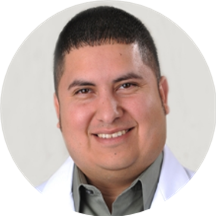 Juan Briones is a concerned and caring physician assistant in Harlingen, TX. Mr. Briones obtained his master’s degree in physician assistant studies from the Baylor College of Medicine. He also holds a bachelor’s degree from St. Mary’s University. Mr. Briones is a part of Sesame Family Clinic. He speaks English and Spanish fluently, which makes him widely accessible to patients from a variety of cultural backgrounds. Mr. Briones is deeply committed to the well-being of his patients. He takes a thorough and precise approach to his consultations to ensure that he is consistently giving accurate diagnoses. He is very professional, respectful. He is a excellent person. I highly recommend him. Excelente, todas las enfermeras son excelentes! !Juan es mi adoracion.